In a split second a lightning bolt can permanently damage or destroy a perfectly healthy heritage tree that has been growing steadily for decades. Lightning is attracted to tall trees because they are relatively good conductors – especially when they are filled with sap in the summer storm months. A lightning bolt can carry 50,000 amps of direct current, a load capable of boiling tree sap instantly. The near instantaneous vaporization of the sap can peel the protective bark right off a tree. 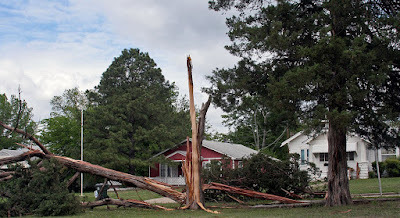 Sometimes whole limbs can be blown off trees as in the pictures and videos below. 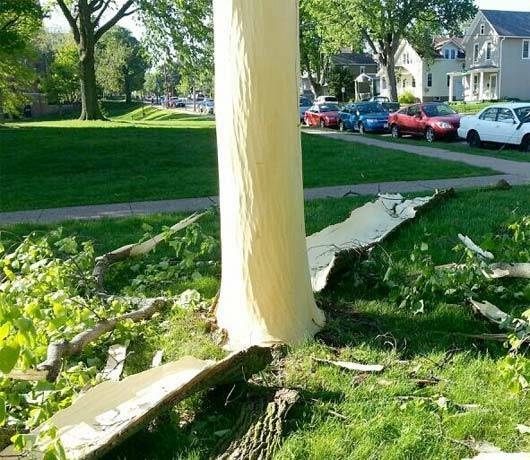 A lightning strike blew the bark off this tree. Trees can be protected from strikes with a lightning protection system similar to lightning rods on a tall building. A heavy copper wire is placed at the top of the tree and affixed to the tree all the way to the ground with special copper standoffs. At ground level the wire is buried 1 foot beneath the earth and clamped to a copper grounding rod driven 8 feet into the earth at the drip line of the canopy. A fuse is placed in parallel with the main conductor so that the homeowner can see if the system has safely intercepted a lightning strike. Tree Lightning Protection Systems (TLPS) are very effective at providing an alternate, safer path to ground that will spare the tree from the damage of a direct lightning strike. The cost of materials for a TLPS installed in an 80-foot-tall tree with a single tall leader is around $300. Labor is about that much again, meaning that for about $600 you can protect a high value, landmark tree from a deadly lightning strike. That is a small price to pay to avoid damage like that shown to the right and in the videos below. The cost of removing a lightning-damaged heritage tree can be well over $1500, not to mention damage to cars or structures from falling limbs and splitting trunks . Tall trees with limbs or trunks within 10 feet of a valued structure. The proximity to the structure increases the risk of side flash, which is when the lightning bolt jumps from the tree to the structure. Side flash can cause electrical surges, fires, and personal harm. High value or historic trees - especially those that are out in the open or that have emergent crowns (i.e are significantly taller than surrounding trees). Tall trees in recreational areas (parks, golf courses, cemeteries) where people may seek shelter during a thunderstorm. Tall trees on the edge of a field facing the prevailing approach path of summer storms. The incredibly destructive force of a direct lightning strike is show by these security camera clips.